Discover Marrakech’s green oasis from atop a camel on this guided, 2-hour, sunset tour. First, visit a berber house for a snack with relaxing mint tea. Then make the short trip just outside the city’s medina quarter to Palmeraie, the Palm Grove of Marrakech. 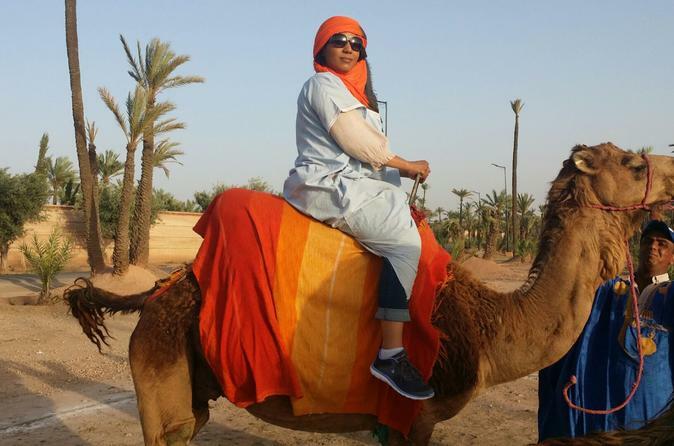 Climb on to a desert dromedary and enjoy the scenic sunset stroll. Bring a camera to capture the moment. A local hotel pickup and drop-off are included on this small-group tour. This was my first tour with Abdul and myself and my wife loved it. He came on time to a scheduled meeting point near our riad in an air conditioned land rover with complementary bottled water the only tour company to do so having used a few. The camel ride across the desert was an amazing experience. We also visited a berber village with another guide as part of the same tour for some refreshments before heading back during sunset, taking pictures along the way with the camels. We liked Abdul and his company so much that we booked further tours with him Essaouira and Casablanca - equally amazing. Would definately recommend, you will not be disappointed. Prompt pick up at scheduled location. Tour guide was very kind and gave us a mini-tour of Marrakech while driving to the camel drop off location. We rode the camels for about an hour more than enough time. The guide would be very proactive about taking pictures of the group. The snacks/drinks at the Berber house was underwhelming since they didn't really interact with us. However, it was a good break from being on the camels! I went on the sunset camel ride through the palm groves of Marrakech and had an absolute blast. I can't recommend this enough. It's the perfect option for someone who wants the experience of riding a camel through classic Moroccan scenery without being gone too long. Abdul picked us up promptly and gave us lots of information about Marrakech on the drive to the camels. He and the guide were super helpful and took fantastic pictures for us. The camels appear to be treated well and you can tell they care for them. The Berber family we visited was very nice and the tea and snack were delicious. You can't go wrong booking this tour with Abdul and his company. A must-do while in Marrakech. These guys were great. We got the meeting time wrong and they waited for us for 15 minutes while we scrambled to get ready. They drove us to the grove and gave us tradition clothing to wear they even had clothing for my 4 and 7 year old. We each got on our own camel and went for a 30 minute walk. 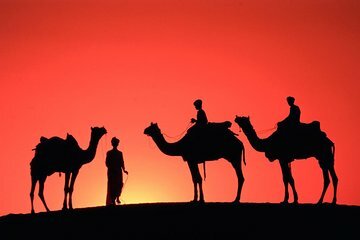 They took pictures of us on the camels with the setting sun. It was a beautiful setting. We stopped for tea and crepe-like snacks. The tea was good, the crepes were a bit greasy but overall it was good we didn't go for the food. We then rode back to our starting point in the dark. Overall this was a great tour. The hour that we spent on the camels was more than enough especially with our young children. The guides were very nice. The only thing I would change is that I would have liked to have a bit more info from the guides as to our timeline but that is my own personal preference. It was pretty much the way it was outlined in their description which is probably why they don't say anything but I had booked this a week before I would have liked them to tell us we're going for a walk, then we'll stop for a bit, take all the photos you want as we ride out because you'll be riding back in the dark, etc. etc.but overall an excellent tour. I highly recommend it. This was definitely a highlight of my trip. First off, Marrakech is a beautiful city. The food, the people, the culture all amazing. This excursion from start to finish was great. Everyone we encountered was friendly and knowledgeable. The absolute best part of this trip was our driver/ guide, Ismail. He was so positive and full of knowledge. We were able to ask him a lot of questions and he gave us the most information about Marrakech we received all trip. He was also very skilled at navigating the narrow Marrakech streets. We enjoyed the camel ride as well, but it is a bit difficult getting on and off the animals. They seemed to be treated well. The Berber house was an interesting experience, but our camel guide had to leave for a bit to wrangle the camels and we were unable to communicate with our host without knowing Arabic of Berber. That felt a bit awkward. This trip was AMAZING! The guides were brilliant, they made us feel very safe and comfortable. The snack and tea at the Berber house was delicious, we enjoyed them whilst the guides taught us some local history and about the camels. We cannot recommend this trip enough. Highlight of our week. the baby camels were so cute, especially Victor! The sunset camel ride was our first adventure in Marrakech and it did not disappoint. We received an email from the tour company with detailed information regarding time and location of pickup. The tour guide picked us up directly from the hotel, on time, with cold bottles of water. The camel ride included authentic clothing. Everything was as advertised and very professional. The camel ride was just long enough not too long. Our guide was very willing to take pictures for us along the way. Overall, enjoyable experience and great start to our trip!